By far the smallest of the main meteorite families the stony meteorites are truly among the rarest of the meteorite types. They are also some of the most interesting and the most beautiful. The Pallasites for example are crystals of olivine the same mineral as Peridot the gemstone. 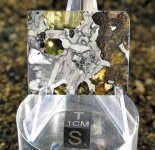 When the olivine crystals and metal of the meteorites are cut and polished it can make something very stunning to see. The other group of stony irons the Mesosiderites while often being striking in appearance are some of the most fascinating for study and the information they can offer science. Both of these groups of stony iron are a mixture of metal and stone in about equal proportions. As with the other meteorite types we sell we have a selection of both individual meteorites and slices that have been carefully prepared. Please visit our site to see our Seymchan meteorite for sale. Seymchan was found in 1967 in Magadanskaya oblast', Russia. These part slices show the beautiful olivine crystals. The Mount Padbury meteorite was found in 1964 in Western Australia. Mount Padbury is a mesosiderite and has been the topic of much scientific research. Like all mesosiderites it is a mixture of metal and silicate minerals. The specimen we offer are in as found condition with their beautiful orange-brown patinas. They will feel rather heavy for their size because of the rich amount of iron they contain. We have some beautiful Fukang Meteorite for sale on our site. In the year 2000 a single large meteorite of slightly over one ton was recovered and classified as a pallasite. The Fukang Pallasite is nearly a half and half mixture of olivine crystals and nickel iron metal. The crystals of the Fukang meteorite are striking when viewed with backlighting. They are clear and have a wonderful color. The metal surrounding the crystals has been etched to make these specimens even more exquisite and will enhance any collection.